Apple has updated three of its developer betas including iOS 11, macOS 10.13 High Sierra, and tvOS 11, but left WatchOS 4 behind on beta 2, for now. The macOS High Sierra update, with build number 17A306f, contains a number of refinements and other improvements like Apple File System integration, migration from H.264 to H.265, and Metal 2. In the latest High Sierra beta, Apple enabled initial Time Machine support, and has added routines to AVKit for developers to allow users additional flexibility for content playback when multiple outputs are available. Additionally, some touch event processing modifications have been implemented, with enhanced timing for ignoring errant touches. 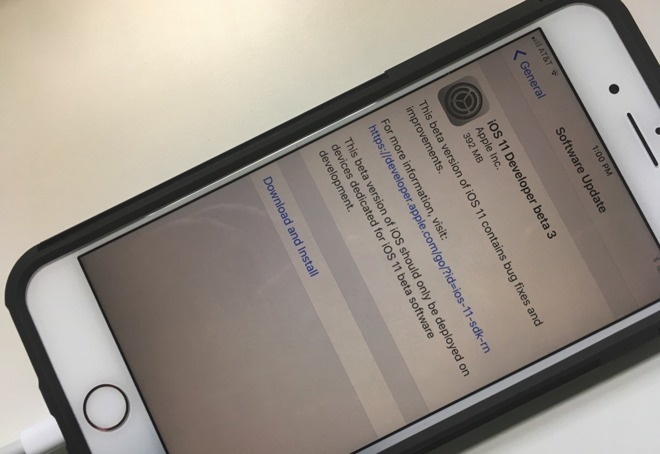 The second iOS 11 beta, has build number 15A5318g. Apple's tvOS beta is labeled as build 15J5324f. Most of the iOS 11 fixes are under the hood, but a fix for connection issues for Bluetooth accessories using Wireless iAP protocol has been implemented. The "swipe up" to close an app gesture in the Control Center has returned. The release notes for tvOS 11 are very short, with no immediately identifiable changes beyond repair of functionality of some third party media playback apps —but DirecTV Now's periodic crashing in iOS 11 is not among them. WatchOS 4 has been omitted this round, nor is a new version of the beta hinted at in the Xcode 9 beta, also released today. Registered devices can get the new beta releases through the Software Update feature, while stand-alone images are available through Apple's Developers portal. Editorial: Could Apple's lock on premium luxury be eclipsed by an era of good-enough gear?